The very first punched-card tabulating machines were custom-built to do just one job, such as tally the US 1890 or 1900 census data. Starting in 1906, tabulators were made more flexible by addition of a wiring panel to let users control their actions to some degree, thus allowing the same machine to be sold into different markets (government, railroad, etc) and used for different purposes. But this also meant that if one machine were to be used for different jobs, it would have to be rewired between each job, often a lengthy process that kept the machine offline for extended periods. 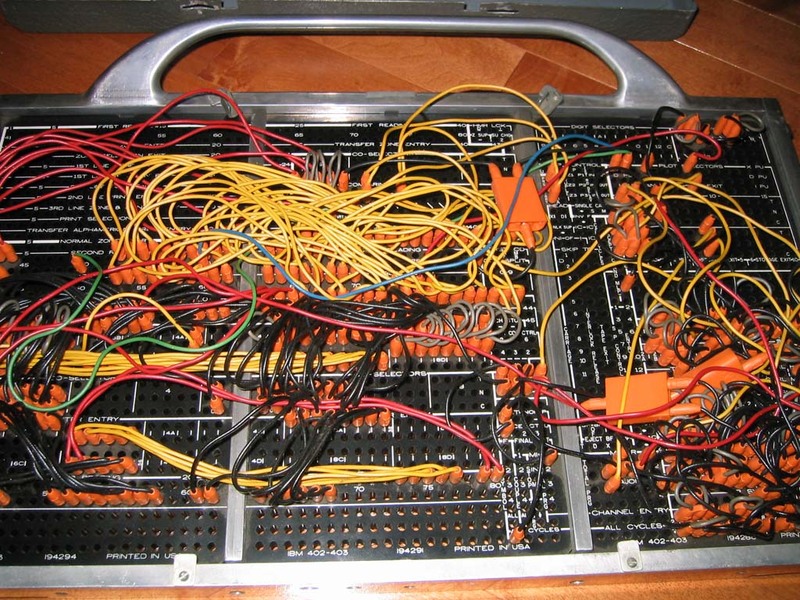 In 1928, IBM began to manufacture machines with removeable wiring panels, or "plugboards", so programs could be prewired and swapped in and out instantly to change jobs. The plugboard fits into a receptacle in the machine, as shown on the IBM 407 Accounting Machine page, which also shows a plugboard programmer at work. If I wanted to multiply, say, 12 times 15, I would punch a one and a two into the first column of a card and the second column of a card, then in the third column I would put another one and in the fourth column I would put a five. So the first two spots would be one and two and that would go into place on the plug board that shows it is the multiplier, and then the third and fourth spots on the card would go to a place that showed it was the multiplicand. And then there was a third slot that was to be the result, and that would punch the answer into whichever column on the card you wanted to put it in. And then you would need six wires to complete that. The following pictures were posted on alt.folklore.computers by Chris Shrigley, 22 May 2003, showing an IBM 402 panel found in a neighbor's garage. Maximize your browser to see full-screen images. 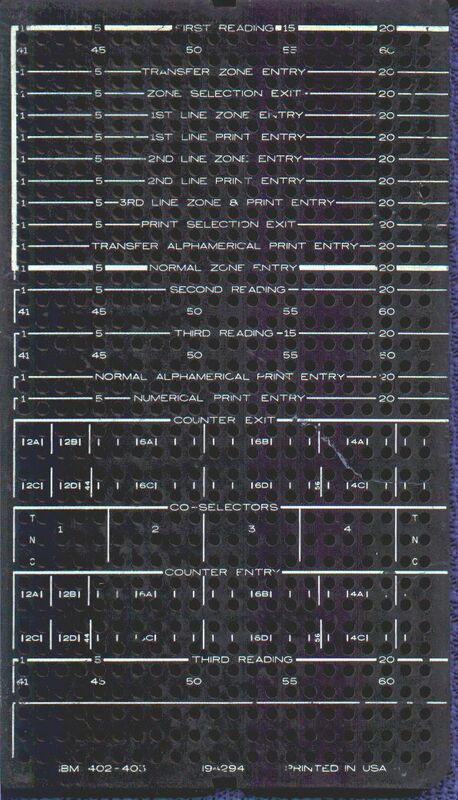 CLICK HERE for a closeup of the right-hand subpanel of the 402 plugboard. I wondered when I first saw [these pictures] what the widgets sticking up were. Dawned on me: those are the tips of the 'new' plugwires introduced with the 602 [my p.83]. In old plugboards like the 601 the wires plugged into a bronze clip behind the hole, and the other end of the clip contacted a prong on the machine. When you looked at the backs of old plugboards you saw a forest of identical clip ends. When you looked at the back of a new board you saw the tips of the wires plugged into the other side, which contacted the machine prongs [new shape, no doubt] directly. Nice engineering! This is what you see in the referenced picha. You also remind me the 407 had a four-panel (smaller panels?) board; I had forgotten. 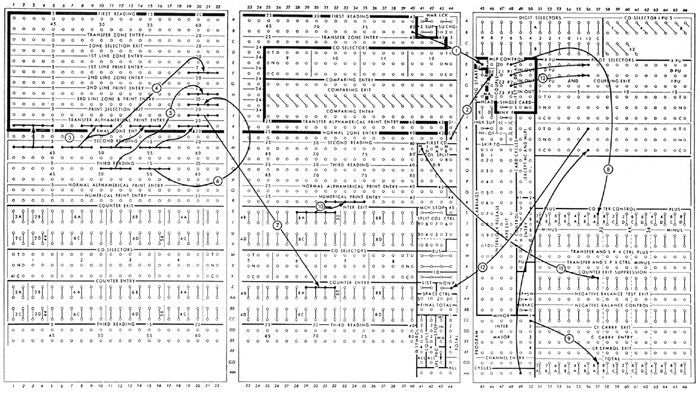 IBM 402/403 Plugboard Diagram (blank) - Click image to magnify. 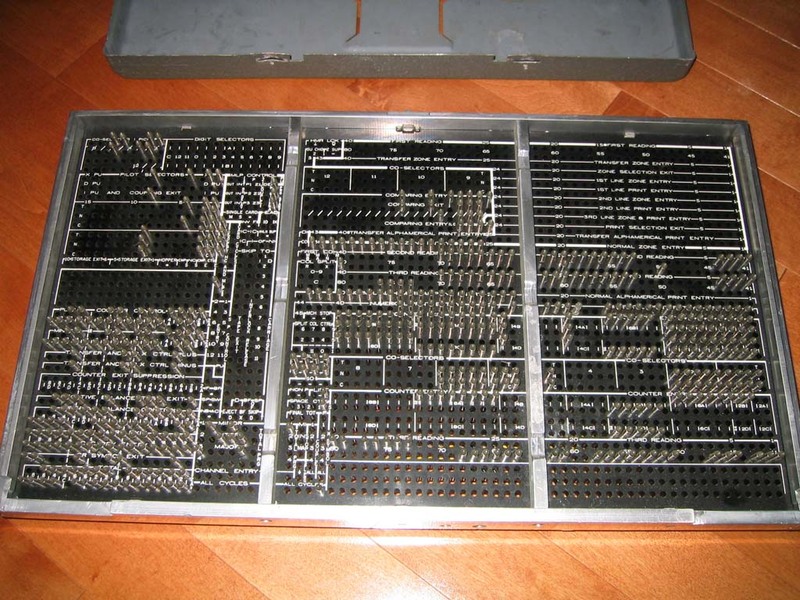 IBM 402/403 Plugboard Diagram (wired for crossfooting) - Click image to magnify. 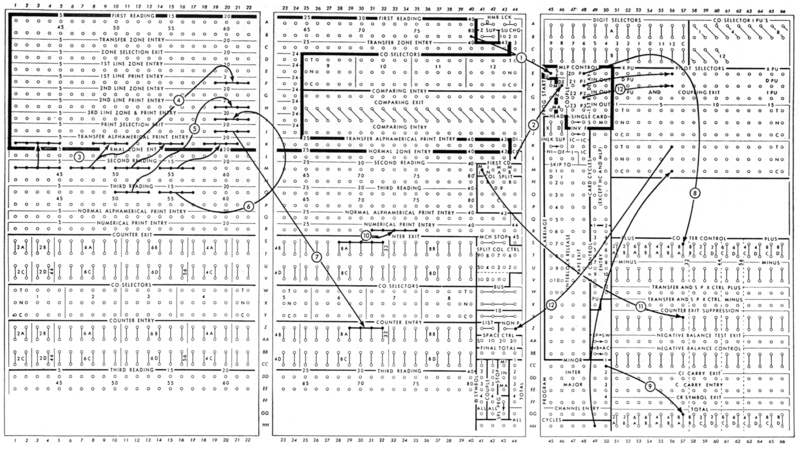 Computing courses, such as the one taught at Watson Lab by Eric Hankam had control panel templates printed on blackboards, so programs could be drawn over them in chalk. 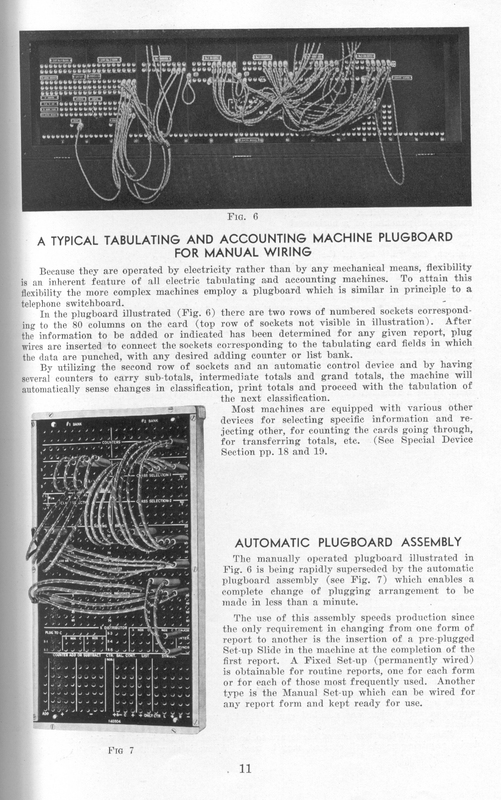 Basic Principles of Wiring IBM Accounting Machines , IBM, New York (undated), 114pp. 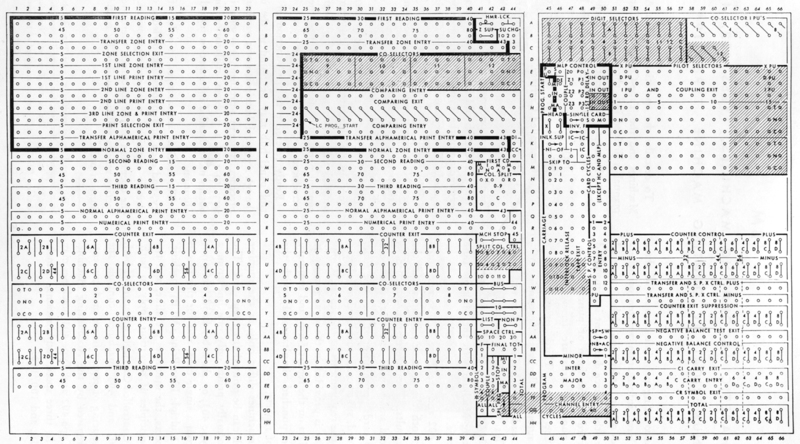 IBM Accounting Machine Types 402, 403, and 419: Principles of Operation , International Business Machines: Eleventh Revision, Form 22-5654-11 (Copyright 1949, 1951, 1952, 1953). 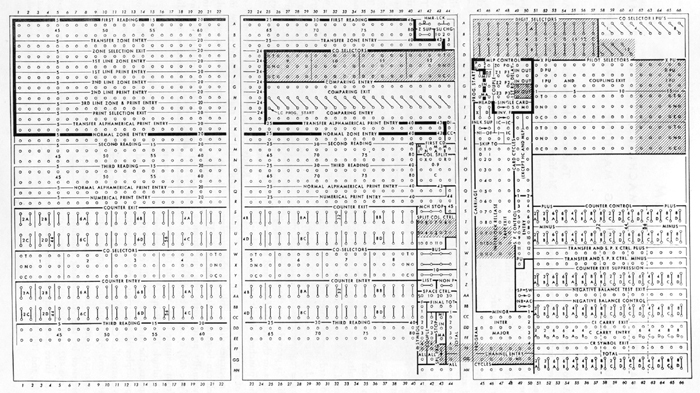 Also see: Baehne  Plate 2, Hollerith Type III Tabulator, IBM 285, IBM 407, IBM 557.